The Super Screener is Your Ticket to Cashing In on the Preakness! After years of ripping-up big race tickets and frustration, I knew there had to be secrets to the big races that could be unlocked. I began an intense analysis of result charts and past performances going back more than 20 years and looking at over 300 horses to develop a system I could use – every year – to help me handicap and bet the Derby, Preakness and Belmont with confidence. I began to notice patterns amongst winners, board-hitters and longshots – and used these findings to develop a system now known as Super Screener. Let the Preakness Super Screener unlock secrets to big payoffs for you! In 2016, the Preakness Super Screener correctly identified the top finishers in the field and cashed 5 Pick-4 tickets! What our customers saying about the Super Screener! What is the Preakness Super Screener? The Preakness Super Screener correctly identified the top 4 finishers in this field, separating them perfectly from the bottom 6 finishers in the field! Why It Works: Each Race Is 100% Different!!! Targeted Preakness criteria that led to Winning Preakness Trifecta recommendations 4 years in a row! The key horses to bet against! How the Screener ranks all of the horses from first to last! This is Denny in central Florida. After our big superfecta score in the Derby, our team (plus one more) played the Preakness. With the Preakness Screener’s help, we decided on a varitey of 1.00 tri bets and .10 superfecta bets, which we parlayed into winning a 1.00 tri for 700.00 and 6 .10 superfectas for 1860.00 which resulted in a grand total of 2500.00!!!! Much thanks to the Screener!! How Did The Screener Rank the Derby? OVERALL – The Super Screener hit 3 Exactas that paid out over $5,000! If you order now, I’ll also send you my exact wagering strategies on the Thursday before the Preakness Stakes, including plays for the Preakness Day Pick 4 races! I will take what the Super Screener criteria says and construct Exacta, Trifecta and Superfecta tickets based on the information, as well as Pick 4 tickets using the Preakness contenders and top undercard stakes entrants! Pedigree guru Laurie Ross provides detailed analysis of each horse in the Preakness in this 20-page report and answers the critical question: Can they go the distance and win in Baltimore? 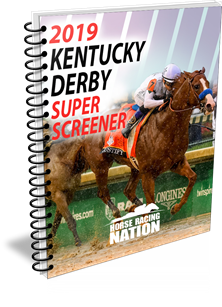 This exclusive is included in your purchase of the 2017 Preakness Super Screener. As part of your purchase, you will receive access to our exclusive Super Screener wagering strategy including tickets customized to a wide variety of budgets. If all of those wagers miss, then we’ll give you your $37.00 back in the form of a complementary copy of the Belmont Super Screener. Plus, you can keep the bonuses! We’re ready to crush the Preakness… are you?